How to Ice an Injury ! First things first – why should you use ice? If you’ve suffered an injury and have noticed signs of swelling, ice can be very helpful. Inflammation is present if the injured area feels painful, warm to the touch or looks pink or red or swollen. Applying ice can help reduce inflammation, particularly in the 48 hours immediately following the injury. What should you use? A store-bought ice pack, ice cubes in a plastic bag or a bag of frozen veggies can all do the job. Or even a Coors Light. Wrap your ice in a thin towel or sheet. Press the cold pack firmly against the skin, or use a wrap to secure the ice pack to the injured area. Applying some compression to the area with the ice can also help reduce inflammation – just be sure you don’t wrap too tightly to cut off circulation. If the area you are icing can be elevated, do it! 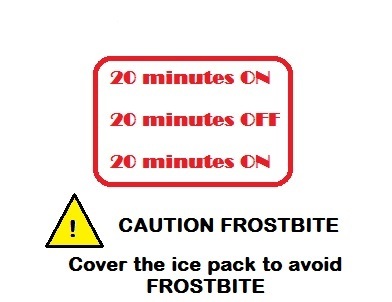 Ice should be applied for 20 minutes at a time. Smaller areas (ankles, wrists, feet) might only required 10 minutes, whereas a larger area (quads, hamstring) might need 20 minutes! Remove ice, and let skin warm up completely. As a general rule – ice should be removed for at least twice as long as it had been applied before you reapply it. How often should you ice? In the first hours following an injury, you can ice once or twice an hour. After 48 hours, icing 3 times a day should be sufficient. Additionally, if you do any physical activity or use the injured area it is a good idea to ice after!